Sooner or later the data is ready. But I have to say I have not hear more about the ISS measurement project, even not whether it have started according to the 2017 plan . I have been written articles about the opposite "force" - it is easier, faster, and much more choking to get started from there. Read the articles I wrote. - These are connected to the same red thread. Read the articles you wrote? No thanks, your choking here was sufficient to preclude that, though thanks for warning others that you were choking more, easier and faster with your "opposite "force"". I have not hear more about the ISS measurement project, even not whether it have started according to the 2017 plan . I have some access to ISS project plans and details. If you like, I can probably find out what happened for you. Do you remember the name of the project? If you give me the name, I'll make some inquiries. Last edited by Bjarne; 20th December 2017 at 12:28 AM. How convenient! Why am I not surprised in the least. It must be tough being so much smarter than Einstein. You’ve posted the URL twice now. Any more and it will constitute SPAM. May I suggest editing your signature to include links to them instead of spamming them in posts? Bjarne, might I suggest you simply let all this silliness drop? A rather dumb link to a 2014 link when you have known the link to the project for many months! This is the official schedule which made the title of this thread a lie from the start. Orbit: Near-circular orbit of the ISS, mean altitude of ~400 km, inclination of 51.6º, period of ~ 90 minutes. The planned duration of the mission is 18-36 months. The first 6 months are reserved for functionality verification of the instruments and performances evaluation. The first objectives are to study the performances of this first cold atom space clock and reach frequency accuracy lower than 3 x 10-16 (with a final goal at 10-16) and deliver a timescale with 25 ps/day stability. The microwave link will have to demonstrate the capability to perform phase comparisons between space and ground clocks with a resolution at the level of 0.3 ps over one ISS pass (300 s), 7 ps over 1 day, and 23 ps over 10 days. You were told the timetable last year and it has been delayed a year. The one experiment that we have details about (ISS Utilization: ACES (Atomic Clock Ensemble in Space) / PHARAO) makes the thread title ignorant. ACES will launch in August 2017. There will be 6 months of calibration bringing us to February 2018. Then at least a year of data gathering - February 2019. Add a few months to write papers and the earliest we can expect results is the middle of 2019 and it may be 20102020. Last edited by Reality Check; 21st December 2017 at 04:09 PM. Thanks Reality Check, I knew the timescale for the experiment Bjarne was referring to had already been posted and made nonsense of his thread title, but I couldn't be bothered to go back and find it. So we're now looking at 1920-21 for the first results to be published, assuming no further delays. Of course nobody except Bjarne expects those results to be extraordinary. ETA: I meant 2020-21 of course. Last edited by Pixel42; 22nd December 2017 at 01:26 AM. ......So we're now looking at 1920-21 for the first results to be published, assuming no further delays. Of course nobody except Bjarne expects those results to be extraordinary. They certainly will be extraordinary if we find they include the invention of a time machine. So we're now looking at 1920-21 for the first results to be published, assuming no further delays. Ironically those are the exact dates the physics community at large began understanding just what had been discovered over the past several years. 1920-21 was when several people in several fields used Einsteins breakthroughs to find even more breakthroughs. Just a senior moment I'm afraid. The one experiment that we have details about (ISS Utilization: ACES (Atomic Clock Ensemble in Space) / PHARAO) makes the thread title ignorant. ACES will launch in August 2017. There will be 6 months of calibration bringing us to February 2018. Then at least a year of data gathering - February 2019. Add a few months to write papers and the earliest we can expect results is the middle of 2019 and it may be 20102020. r.
That is good news for the fake science brainwash industry. Still a few years massive propaganda will fill the ether and the heads of innocent student, - before these victims will understand, - they have been wasting their youth on science fictions. However, well, in a meantime we will see more and more evidence showing the earth is accelerating, - with such significant acceleration that the Earth must reach c, within “relative short” time after that the source of the acceleration was there. So we will be force to understand that there must exist be a breaking force as well. This is what I call relativistic Resistance against motion. We will see 2 huge cracks in the theory of relativity the coming few years. Cracks that will force even the low C.w IQ to rebellion against the government financed systematical brainwash. Last edited by Bjarne; 23rd December 2017 at 04:29 AM. So your end of Relativity has been kicked down the road? a) It's not news. The only bit that's news is the delay of a year. The earliest this experiment could have produced results was already too late to justify your thread title when you first created it, as you'd have known if you'd bothered to look into it. b) The delay is certainly good news for the "fake science brainwash industry" that's sitting on their arses spewing ill formed and unsupported "theories" on the internet, as it means it will be a little longer before real scientists - the ones who actually design and carry out experiments - prove then wrong yet again with these particular experimental results. Let's say you're going home to your grandmother at Christmas. Try to tell her what "the curvature of space" (really) is, - at least what theoretical cause / effect connection there is between matter and the curvature of space. Remember to tell her what the curvature of space is made of. And don't forget to tell HOW the curvature of space is the cause of the biggest CAT weight is 123 ton.. Tell here how the CAT know that space beneath it is "curved", and to test here understanding ask here after some time; - what that have to do with the cause of gravity ? When she says that sounds really very very logical, - then and first then try to tell me which pedagogy you used? Remember my opinion, it's forbidden to tell her the same thing 7770235235634356 times until she breaks down and says, it's probably just me that's stupid - it's called brainwashing. You have to keep it all cool OK ? Am I getting this right? There’s a force Bjarne says exists but he can’t describe or demonstrate it, so now he’s posited a new, opposing force to explain why we can’t detect any effect of the first force? Is that about it? Yes, that is exactly what he claims. Otherwise, he would have to consider the possibility that he is simply wrong. There are 2 "forces" - it have been so all the time. This summer I solved how to measure the 2nd one, with modern devices. These two "forces" only equalizes each other when the maximum possible DFA speed is reached (600 km/s) . When you search for EFDA, you will understand more. EDFA is an abbreviation for: Effective Dark Flow Acceleration. In short, it means that as soon as there is motion opposite Dark Flow, RR will decrease and EDFA become active. DFA is a constant factor. RR is speed dependent. It is only EDFA that can be measured near arctic by certain solar and moon eclipses, not the full range of DFA. Very short, - EDFA is a aspect of DFA. Last edited by Bjarne; 23rd December 2017 at 10:04 AM. I am predicting completely unexpected choking results that can and will be measured. This is how real scientists works. Last edited by Bjarne; 23rd December 2017 at 09:38 AM. This is how real scientist works. A real scientist does indeed make predictions. "So can any man." Real science is established only when these predictions are proven true. Which has yet to occur for you and there is not indication at all that the test you currently hang your hopes on will support your theory. Ironically even your very broad prediction that the Theory of Relativity will began to fall apart in 2016/2017 has shown that your general prognostic abilities fall short. Real science is not continually creating theories and proposing that they will be confirmed in just a few months, but with the confirmations somehow always just a bit out of reach- soon to be demonstrated but not quite yet. That is just making up stuff. Last edited by Bjarne; 23rd December 2017 at 09:59 AM. Sounds like the plot for a very early Superman comic. I call it something else. Oh noes! Relativity is cracking up! Up until her death at age 96, she was more lucid than the posts to which I am now responding. I never tried to explain that to her, but I don't think she'd have had any great trouble with the concept. In my experience, the basic concept of intrinsic curvature in Riemannian manifolds can be explained to most people. The only exceptions I can recall were crackpots and young-earth fundamentalists, who fail to understand the concept of curvature because their beliefs motivate them to avoid understanding anything to do with scientific theories that threaten their beliefs. If the curvature of a baseball's skin is made of leather, then the curvature of space is made of space. Maybe I'm missing something. To me this looks like self-kittening a thread. Real scientists do indeed work out the testable consequences of their theories and look forward to experimental tests of those predictions. 1. State problem after doing careful research on previous observations, results, data, and hypotheses. 2. Formulate hypothesis consistent with these known facts and prior studies. 3. Design experiment to test your hypothesis. 4. Do the experiment. Let me repeat that, do the experiment ( or have it done). Until then a hypothesis is just a hypothesis. But a hypothesis rooted, such as yours, in thin air is not even a scientific hypothesis. It is an meaningless guess. A whim. A flight of fancy. Einstein's hypotheses were rooted in rigorous mathematical principles and existing physics. Yours are not because they do not incorporate the parts in italics above. The parts that would make them scientific hypotheses. 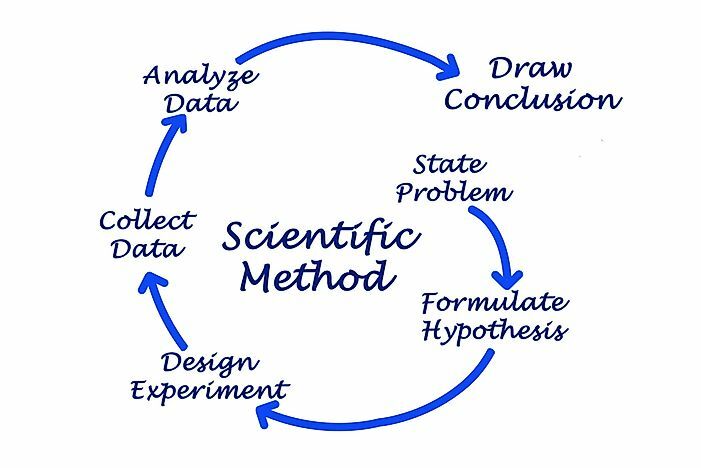 At each cycle Modify your hypothesis to reflect the new results.. Here you haven't and I suspect you will continue to not do so with your own theory. Last edited by Giordano; 23rd December 2017 at 11:36 AM. Here's another part of real science you may wish to add to your endeavors: listen to criticisms and concerns. Either you should be able to demonstrate that your theory is bulletproof against them or you should be willing to modify your theory in response. In science critics are your friends. They are working with you to find the truth. If all you hear is blah blah blah then you are not doing science, you are doing religion. 1. There are plenty problems with the prevailing paradigm. A new paradigm that i have shown, can solve surprising many of these. If you read the whole theory you have all the answers you ask for, no reason to repeat all that. Here's another part of real science you may wish to add to your endeavors: listen to criticisms and concerns. There are no specific criticism against the method I have shown. Either you should be able to demonstrate that your theory is bulletproof against them or you should be willing to modify your theory in response. In science critics are your friends. They are working with you to find the truth. If all you hear is blah blah blah then you are not doing science, you are doing religion. I have tell you the truth. I see. You can’t prove anything. Your claims are bald faced lies and you’re hoping you can cherry pick anomalies from work by real scientists to prop up your physics themed fairy tale. Thank you for admitting you’ve got nothing. Got anything other than insults and links to a paper we all suspect you don’t actually understand? FYI: The paper you're suggesting Bjarne does not understand was written by Bjarne Lorenzen, and is titled "Extension to the Cause of the Allais Effect Solved". That solution was claimed on the basis of "a remarkable mysterious anomaly between 40 and 50 μGal." The cause of this anomaly is, of course, unknown. To speculate, one can suspect a few different causes, for example that something was wrong with one of the gravimeters etc. However, even though this measurement so far must be considered an unsolved mystery, there is no doubt that the above-mentioned theory  and  predicted exactly such a strange behavior / anomaly a few months earlier that summer. then, after the lunar eclipse, would gradually decrease (relative to the relative measurement) - as we have now seen by Figure 1. This would, of course, (in addition to what has now been revealed) have shown a perfect cause effect coherence, underlining that the position of the Moon (from time to time) is, in a very predictable way, responsible for exposing Dark Flow Acceleration in a way so that DFA can be measured by much more effective and precise methods / devices than pendulum measurement. Anyway, the measurement taken 7 on August 2017 should be a big hint showing that a significant aspect of science could very well have been entirely overlooked. Time must now have come for the scientific society to take the Allais effect much more seriously. In other words, the problem is now solved because there's a mysterious anomaly for which the author is fully confident that more data will confirm his conjectures, so it is now time for the scientific society to take this "much more seriously." I began to suspect the author of that paper is no better a scientist than Bjarne himself. The original online version of this article (Bjarne Lorenzen (2017) The Cause of the Allais Effect Solved. Volume 7, 69-90 doi: 10.4236/ijaa.2017.72007) unfortunately contains several mistakes. 2) The way to calculate the magnitude of the Allais Effect was wrong. Vector addition must be used instead. However the magnitude of the Allais Effect is the same as mentioned in the article, only the method of calculation has changed. One might wonder what kind of journal would accept and publish papers such as these. Frontiers of Astronomy, Astrophysics, and Cosmology is a pay-to-publish online journal that began publishing in 2015. The five papers published so far in 2017 were written by three authors, each a solo author. One of those authors wrote two of the five papers published in 2016; Bjarne Lorenzen wrote one of the other three, with the title "Modified Theory of Relativity." The abstract of Lorenzen's 2016 paper says "Prediction: The special theory of relativity will begin to fall apart already in the years 2016 to 2017; when the theory of relativity will be tested on board the ISS and Galileo 5 & 6." Nine of the eleven papers published in 2015 were written by the same pair of authors, with a couple of those papers adding one or two co-authors. Clicking on the journal's link for the full text of Lorenzen's 2016 paper takes me to a page that says "Withdraw this article(due to some internal problems related to the article)". In short, I am less than certain that papers published in that journal have been peer-reviewed as rigorously as papers published in more established journals. That presumes Bjarne submits to even having peers other than, well, just Bjarne. A presumption evidently not supported by the papers cited references. Thank you for highlighting a number of factors to take into account when reading the paper. Based upon the content of this thread however, I maintain my stance that the "Bjarne" in this thread does not understand the subject matter of the paper, regardless of if he wrote it or not. The flaws within the paper and the circumstances of its publishing only serve to enhance my earlier assertion. Evidence that Bjarne Lorenzen does not understand the subject matter upon which he (or she) writes only further supports the assertion that our Bjarne does not understand the subject matter of the paper, either because it was foolish to cite it, or because it was foolish to write it. Its very simple my dear. A NASA teams continue to claim that Dark Flow (DF) Exist..
A real scientist must have the same feeling in his blood as when a farmer see a lot of BS on his field. If there is a lot of BS there must be Bulls . In the same way for a real scientist, - if Dark Flow is TRUE, there must be Dark Flow Acceleration (DFA). I have shown a scientific method how it must be possible to measure whether DFA is true. I have in details explained WHY, all this belong to the same pipe of tobacco. Even when the team on Greenland was 15 hours too late, still they measured a significant anomaly, that have a signature excactly as predicted. You can compare that to a farmer that will find a HUGE fresh load of BS on his field. Now he can both see and smell there MUST be bulls somewhere. But its seems you have understood nothing of all that. Last edited by Bjarne; 24th December 2017 at 01:18 AM.